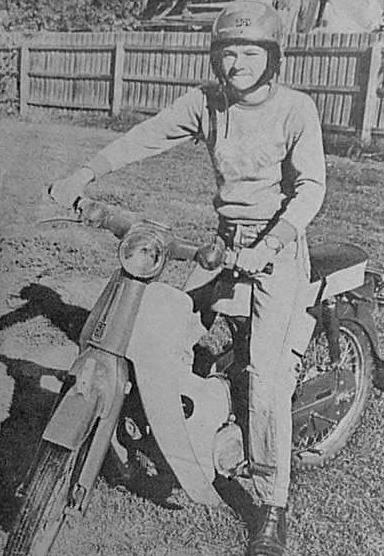 My first "bike" was a Honda C50 - Cub. 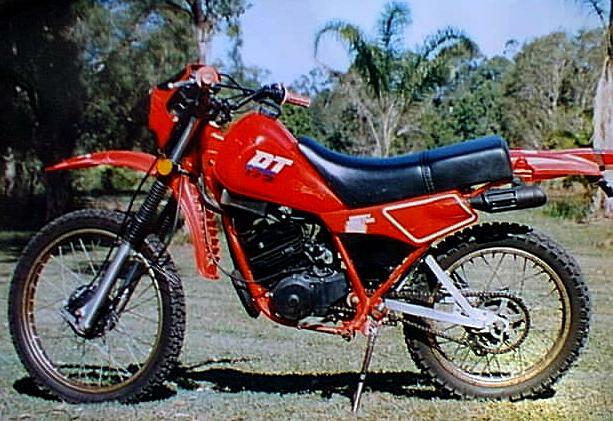 I used to ride this around our paddock in 1979-82. It had a 3 speed gearbox and a centrifugal clutch. Easy to kickstart & easy to ride. It was also very quiet, but lacked power. 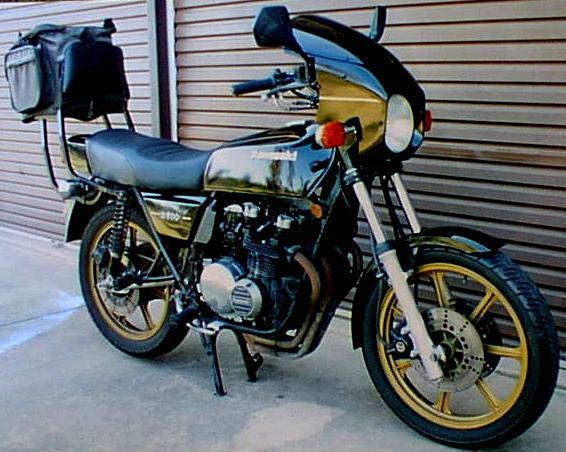 One summer holiday I took the yellow plastic fairing off to prepare it for off road use. I made a "bash plate" from oregon particle board to protect the engine. It wasn't a very exciting off road bike,as it couldn't climb hills and was basically designed from the ground up for use on smooth roads. 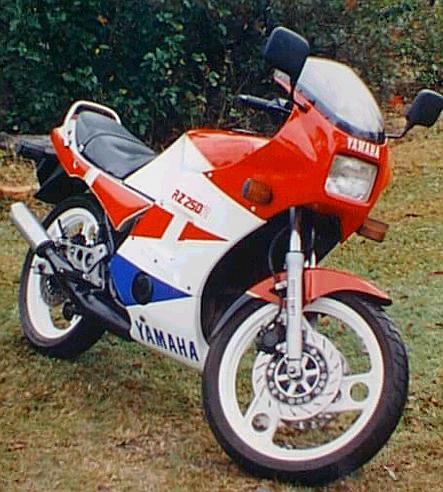 My second "real" bike, the GPz250R was fantastic! It NEVER let me down. It had a noisy clutch (at idle) from the day I bought it until I sold it, but that's my only complaint. 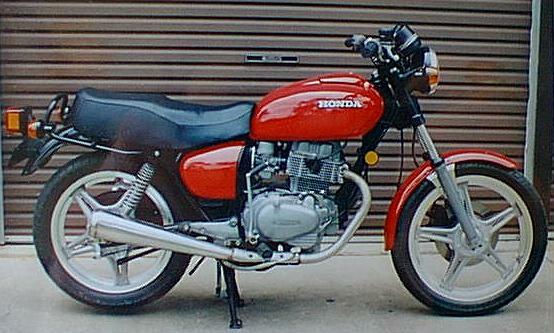 The handling, speed and overall feeling of the bike was a quantum leap from the CB 250 Twin. 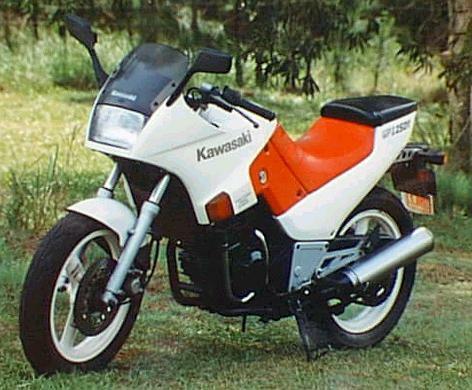 After owning the GPz250R I was very impressed with Kawasaki bikes. I was hooked on riding. This is one of the few bikes that I could ride to work, get off, go to my desk and still be smiling. Having said that, life with the RZ wasn't always sweet. 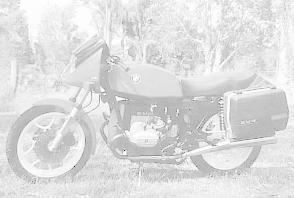 Firstly it needed a new stator a few months after I bought it, then one night when I was riding home from a friend's house I heard a noise in the exhaust and the bike seemed to loose a bit of power. A few traffic lights later and the bike was loosing more power. Having a friend that had been through 2 RZ engines I was starting to worry. I pulled into the nearest car park to have a closer listen to the engine, then suddenly the engine let out a loud screech from it's exhaust - I turned the engine off immediately. Hoping the engine wasn't seized I pushed on the kickstart to see if the engine would turn. Luckily it did. Not taking any more chances I took the bike home from there on a trailer (Thanks Peter). Taking the barrels off revealed a broken piston ring, but no damage to the bore. I replaced the pistons with oversize Wiseco ones and got the barrels bored and honed. After assembling the engine I decided to replace the seal on the gear pedal, which involved removing the side cover from the engine. Everything seemed to be fine until I was riding the bike and the temp gauge went sky high!! I stopped the bike and left it for a while. I returned to the bike to see a green oily slime vomitting from the rear of the motor (where the chain comes out). The slime had also lubricated the rear tyre. Why? When I removed the side cover I accidently must have damaged the O-ring that seals the liquid cooling from the transmission oil. Result - lime milkshakes!! 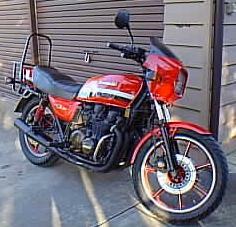 I repaired that problem and the bike runs well now, but it's out of registration. 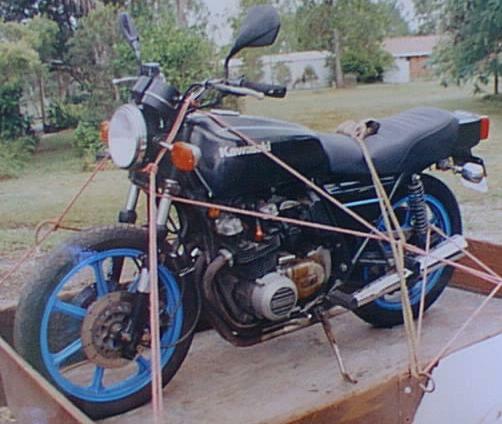 The Z500 was a bit of a wreck when I bought it, and it had blue wheels!! 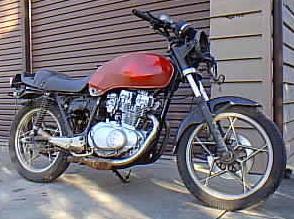 I bought this bike from Junko after it had been crashed. I replaced the bent forks & frame and resprayed it. 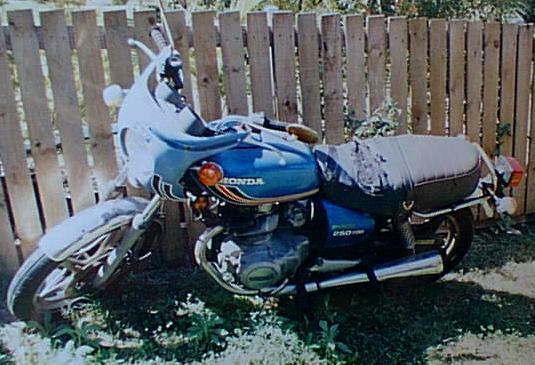 This was the bike I got my "Open licence" on. It had a 4 into 1 exhaust that sounded terrific and I added the fairing and luggage rack to make the bike more comfortable and useful. 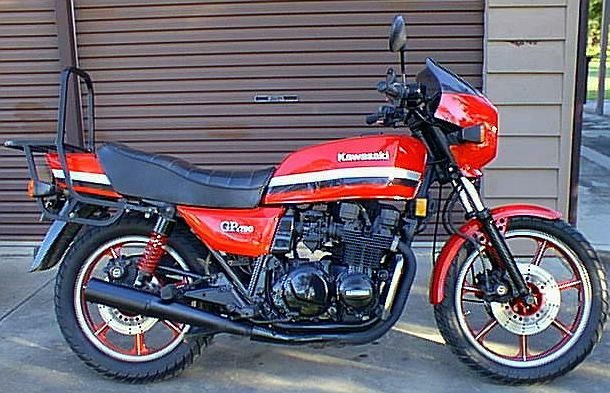 Once again, this Kawasaki was reliable with the only problems being related to lack of maintenance (ie. NO WATER in the battery). This bike was heavy at around 194 kgs but felt lighter than the Honda CB250 to ride. 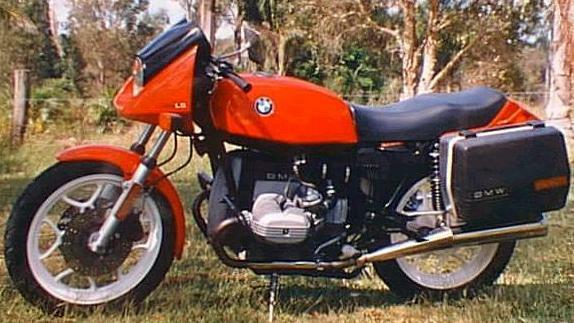 Power wasn't bad at 52 hp, but after buying the BMW the Zed didn't get ridden much so I sold it in 1997. 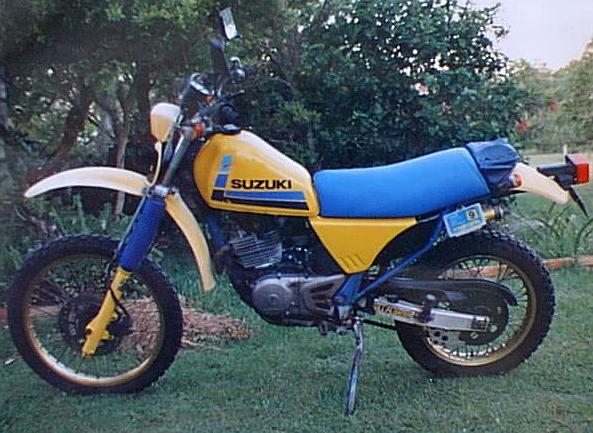 This was a Suzuki DR250 Enduro (sporting a front disc) it was too high for me and too heavy. 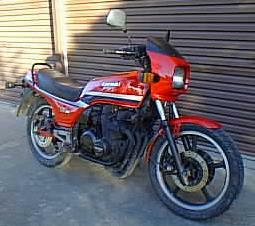 I bought this bike so I could go off road riding, sounded like fun, but this bike was exhausting to ride in the bush. I decided to sell it after I purchased the much more nimble DT 175. The BM is my everyday bike. The old workhorse. It feels more like a 250 to ride, due to it's low centre of gravity. It weighs around 185 kgs and puts out about 50 hp, not a high performer, but it gets you there. 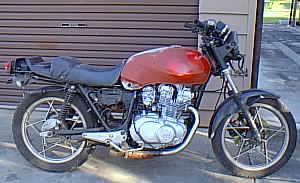 After owning the Z500 I wanted a bike that was EASY to work on. The BM certainly is that. The carbies hang off the engine, the tappets are easy to adjust and the tank can be taken off in seconds. It's not everybody's cup of tea - it is quite different to ride from Japanese bikes of the same era. It shakes and wobbles all over the road, doesn't handle well (even with new Koni shocks), is low on power, but (surprisingly) it feels very safe to ride. 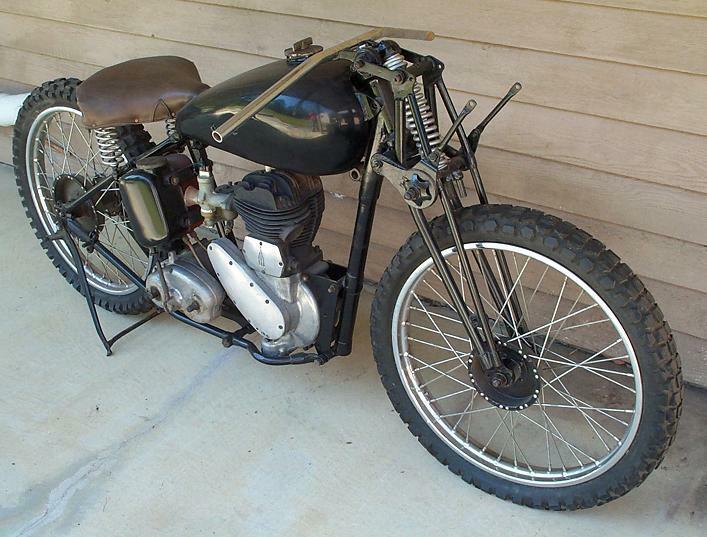 The oldest bike I own is this 1937 BSA M20. As you can probably guess, it's not working yet. It may be a while until it runs, but I bought it because I thought it would be nice to own an old bike. This is what an M20 should look like. 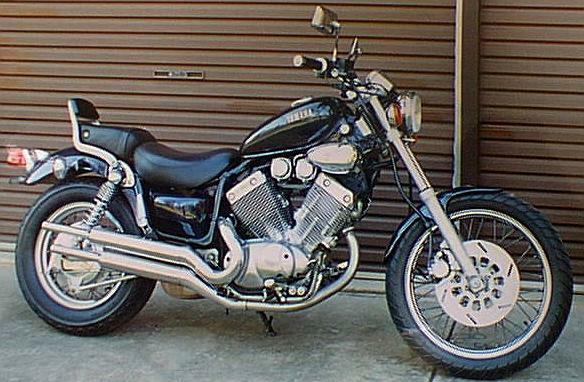 I sold the Virago in Dec '97 - Mechanically it was a very strong bike and it handled well (for a cruiser), but I didn't like the riding position. I was used to a "touring/sports" position and "cruising" wasn't my scene. I found I'd get a numb bum after about 1 hour and at 100kms the wind was blasting on to my upright body, trying to rip my arms off. As a bike for around town, the Virago was great. It felt light (only 182kg) and with the standard pipes it was very quiet (probably too quiet as all I could hear was tappet noise). Sold in Japan (an other places?) as the XV400 it was bored out an extra 135cc (why 135?...) and marketed in Australia as the XV535. 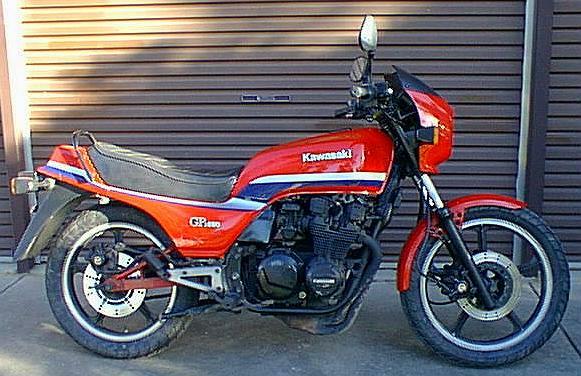 After selling the Z500 I missed the sound of a Kawasaki inline 4, so I bought this GPz 750 in pretty good condition in December 1997. At 217 kg it feels heavy and doesn't handle well, even compared to the BMW!! But with 80 hp it's as much fun to ride as the RZ. I finally decided it was too big and heavy and sold it in August 2002. 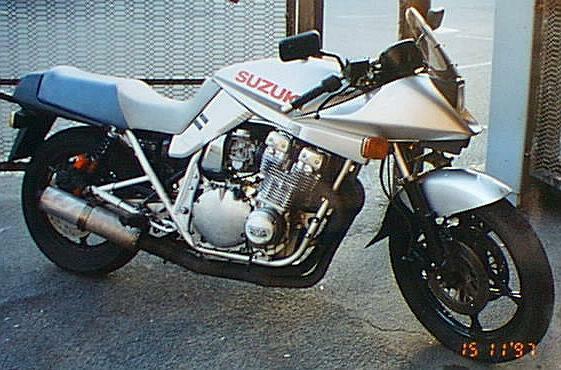 I'd like to buy a Katana GSX750, but I can't decided between the original Katana, styled by Hans Muth (who also did the BMW R65LS) or the later, pop-up headlight version. 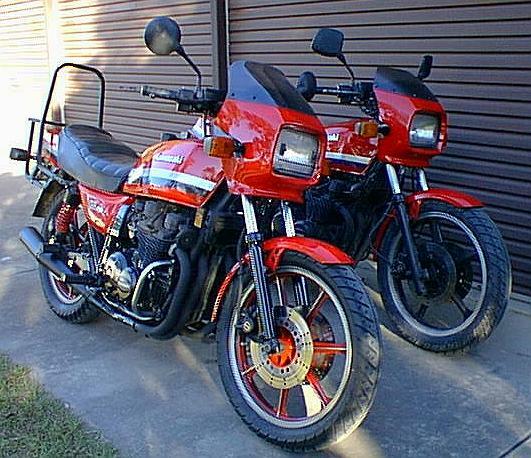 I was in High School when these bikes came out and remember seeing them new, they looked fast even when they were parked. Another bike I'd like (along with a lot of other people) is a Brough Superior SS100. 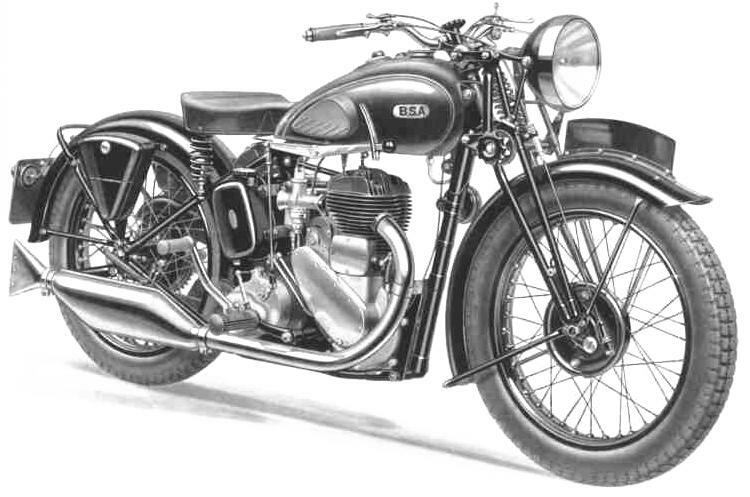 These bikes were known as "the Rolls Royce of motorcycles" when creator George Brough marketed them in the 1920s-40s. Unfortunately these bikes are becoming more expensive with age. T.E.Lawrence was killed whilst riding his Brough Superior in 1935. The movie "Lawrence of Arabia" opens with T.E.Lawrence cleaning his Brough Superior. He then rides off for the last time.